A PDF version of this migration guide can be downloaded here. 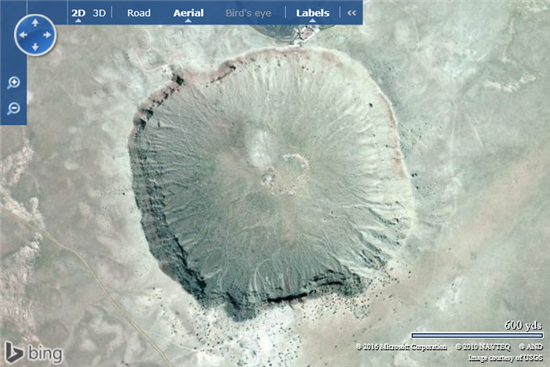 It is possible that your application appears to be pointing to older versions of Bing Maps (i.e. v6.2 or v5), however these versions are actually redirecting to the v6.3 control on the backend and have been doing so for over 3 years. So in reality your application is using v6.3. 1.3 Why Bing Maps V8? A cleaner, more modern, programming model. The Bing Maps v8 web control is the recommended migration path from v6.3. There is a small learning curve as there has been some notable improvements made in the code syntax from v6.3 to v8. When it comes to performance the v8 is miles ahead of v6.3. Version 8 is capable of rendering data much faster than versions 6.3 and 7, and can also render a lot more data too. When dealing with small data sets on a standard browser this might not be that noticeable but if you need to display a large data set or are using a mobile browser this increased performance makes a big difference. Noticeable performance issues in v6.3 have generally occurred when 200 or more pushpins have been added to the map, while v8 is capable of rendering thousands of pushpins and polygons with good performance. Version 6.3 supported 22 different culture codes (languages). Version 8 supports significantly more culture codes and uses the Bing Maps REST services to perform geocode and route requests which has support for 117 languages. In v6.3 of Bing Maps the map consisted of a single map that was disconnected at the edges. In reality we know that the far edges of the map wrap around and attach in real life but we can’t see this in v6.3. This becomes an issue if you want to represent information that crosses that edge. In v6.3 if you try and draw the shortest path between Sydney Australia and Los Angeles, USA it would take you across the full map. In v8 the map wraps around such that we can continually pan left or right just as if you were to spin a globe. In addition to this if you were to repeat the previous task of drawing a shortest path, v8 would draw the line going over the Pacific Ocean which is the shortest most logical route to take. Overall this makes for a much better user experience. In v8 not only can you easily render routes on the map but users can also drag the route using the mouse if they wanted to modify it to go through a certain area or avoid another. In addition to this the directions module also generates nicely formatted directions for you with keyword bolding, and turn by turn icons. So no more having to generate HTML from the raw route data like you have to with v6.3. In addition to this hovering over one of the instructions shows you where that location is on the map. The direction module also has an optional input panel you can display which can save you a lot of development. Version 8 also provides driving, walking and transit directions. Traffic data has been available in Bing Maps for a number of years, however, in earlier versions of Bing Maps it was only available in the US. In v8, traffic data is available in 35 countries. In v7 the concept of map sessions was introduced and has been carried over to v8. When one of the interactive Bing Maps map controls is loaded, a special Bing Maps key, called a session key, can be retrieved from the map and uses to access the Bing Maps REST and Spatial Data Services. Any transactions occurred using the session key as non-billable in the reports. A session starts when a map is loaded and ends when the browser is closed, the user leaves the page, or the page is refreshed. This can help significantly reduce the number of billable transactions that get generated by your application and as a result make a big difference in terms of licensing by potentially lowering your overall billable usage. Not only is v8 supported in most modern desktop browsers, it is also supported on all major mobile browsers as well. The Bing Maps 3D control was released as a beta control over a decade ago. It was originally developed using Active-x which required an add-in to be installed into your browser. Since the original release of this control web technology has changed significantly. The Bing Maps team announced the deprecation the 3D control in November 2010 and officially deprecated it in December 2011. Even though it was deprecated it has been left online so as not to break applications built on top of v6.3. If you require a 3D map control, we recommend taking a look at the Windows 10 UWP map control which provides rich 3D maps that are significantly more detailed than what was available in v6.3. Review existing application and identify where Bing Maps v6.3 code is being used. Identify which features of Bing Maps v6.3 are being used and review the migration information in this document or Appendix A: Bing Maps v6.3 to v8 Class Mapping. Migrate code to version v8 of Bing Maps and update script reference to point to the new v8 map control URL. Deploy your application to your production environment. The remaining sections of this migration guide provides sample code that introduces you to the basics of how to leverage the most commonly used v6.3 functionality using the v8 API. You will also find discussions on the differences in the general development cycle and authentication between the two platforms. 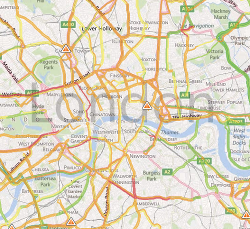 Here is a list of useful technical resources for the Bing Maps v8 web control. The second function is recommended for all other applications that generate less than 500 thousand transactions a month. 1) Create a Bing Maps account at the Bing Maps Dev Center. You can find documentation on how to create a Bing Maps account here. 2) Create a Bing Maps key. This section of the migration guide discusses the differences in authentication functions between the v6.3 and v8. The main difference between these versions is that v6.3 requires you to create a map object, set the credentials on it and then load it, where as in v8 this all gets done with one line of code. Additional the URL to version 8 has changed completely to align with the newer Bing branding, and to also reduce confusion about the meaning of “dev” in the v6.3 URL. Where ‘myMap’ is the id of the DIV element on the page that contains the map. Where 'myMap' is the id of the DIV element on the page that contains the map. The script reference used above will load the map components synchronously as needed. Version 8 also supports asynchronous loading of the map control as well which is recommended for better page load performance. When loading the map script asynchronously you will need to provide the name of a callback function that will be called when the map script has been downloaded. Here is an updated map script reference that calls a GetMap function wen the script has finished downloading. In the Bing Maps REST API, a Bing Maps key must be passed with each request, included as a parameter in the URL. In the URL examples, replace BingMapsKey with your application key. Localization of maps is the process of rendering maps in a specific language other than the default. Both v6.3 and v8 support localization. Version 6.3 required that you pass in a culture code to set the language of the map, however version 8 automatically tries to detect the appropriate culture code for a user based on their browser settings and location. This saves a lot of work in trying to manage the culture of the map yourself. However, like v6.3 it is possible to specify a culture code, which will override the default behavior. This is useful when testing, or if you only want the map to support a single language. If you do wish limit the map to a single language, the following is an example of how this was done in v6.3 and how it can be done in v8. To get a localized map using v 6.3, add an mkt parameter to the API script reference. Here is an example of Paris in v6.3 with the culture set to “fr-FR”. The Bing Maps v8 web control no longer requires the use of a mkt parameter to localize the map. If one is not provided the map will automatically attempt to set the language of the map based on the user’s browser settings and/or location. This section provides descriptions and examples of how to migrate your applications using the v6.3 control to the v8 control. Before going into great detail about any particular functionality, it is worth looking at some basic examples that demonstrate v8 equivalents for the most commonly used mapping functionality in the v6.3 control. Add a div tag to the body of the page which will act as a placeholder for the map. Create an instance of the respective map class. 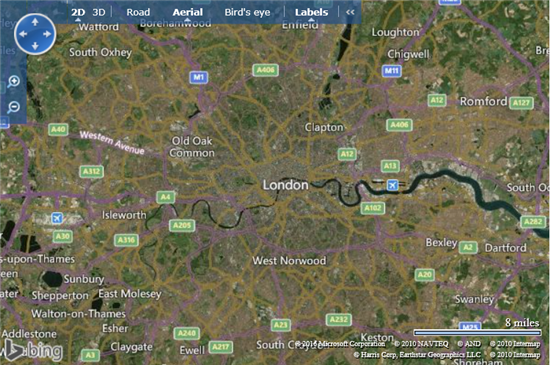 In both examples below show how to load a basic map such that it is centered over London, UK which is at coordinates (51.50632, -0.12714) at zoom level 10 with aerial imagery with labels displayed. 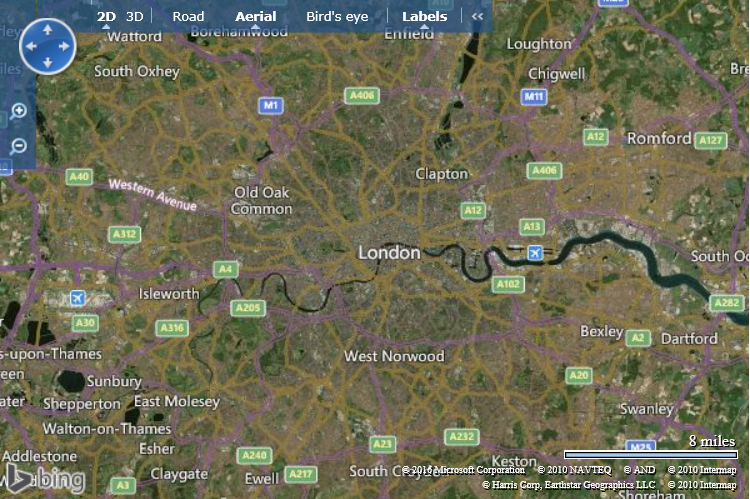 The following code is an example of how to load v6.3 such that it is centered over London, UK which is at coordinates (51.50632, -0.12714) at zoom level 10 with aerial imagery with labels displayed. In v8 things are slightly different. Rather than passing in our view settings as parameters when loading the map, instead an object that contains the view settings is passed in as a single parameter to the map. 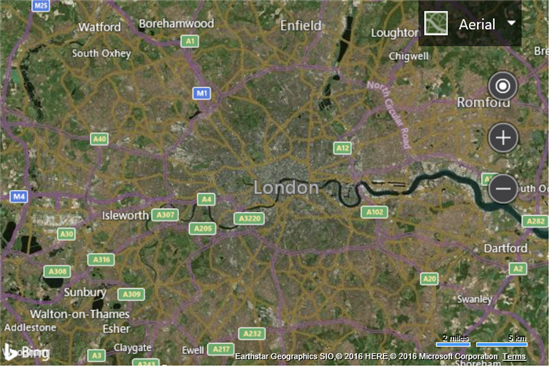 The following code is an example of how to load Bing Maps v8 such that it is centered over London, UK which is at coordinates (51.50632, -0.12714) at zoom level 10 with aerial imagery with labels displayed. The v6.3 map control can be programmatically moved using one of several functions on the map including; Pan, PanToLatLong, SetAltitude, SetBirdseyeOrientation, SetBirdseyeScene, SetCenter, SetCenterAndZoom, SetHeading, SetMapMode, SetMapStyle, SetMapView, SetPitch, SetZoomLevel, ZoomIn, ZoomOut. This is a lot of functions and can be a bit confusing to figure out which one to use, especially since many of them appear to do the same thing. The following example moves the map center to the specified location (35.027222, -111.0225) and zooms to the specified level (15 of 19 available zoom levels). However, if you try this, you will find that only the zoom level changes on the map. In the v8 control, you can use the setView function to accomplish the same thing as nearly all of those functions mentioned in the v6.3 section. The setView function takes in a set of view options which are used to define how the map should be displayed. This significantly reduces the complexity of the map control and also reduces issues like we saw in the previous example. The following example moves the map center to the specified location (35.027222, -111.0225) and zooms to the specified level (15 of 20 available zoom levels). Geocoding is the process of determining a specific latitude and longitude for a street address or other geographic feature or vice‐versa (reverse geocoding). The following examples highlight the differences in geocoding syntax between the v6.3 control and the v7 control. When using v8, geocoding can be accomplished using the Search module. Being a module you can delay the loading of this functionality until it is needed by the application. This helps improve page load performance. You can load the search module using the following code. The term geocoding generally refers to translating a human-readable address into a point on the map. The process of doing the converse, translating a point into a human-readable address, is known as reverse geocoding. When using v8, reverse geocoding can be accomplished using the Search module. You can load the search module using the following code. Both the v6.3 control and the v8 control allow you to add one or more pushpins to the map controls. 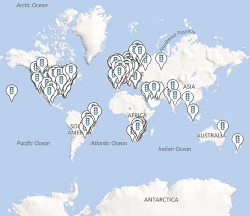 Pushpins are used to mark specific locations on a map. In v6.3 you would create a VEShape object and define it as a Pushpin. The following creates a pushpin in the center of the map and makes it draggable. In v8 there is a Pushpin class that you can use. The following creates a pushpin in the center of the map. You can find additional information on how to customize pushpins in v8 here. Both the v6.3 control and the v8 control allow you to add one or more polylines and polygons to the map. In v6.3 you would create a VEShape object and define it as a Polyline or Polygon. The following creates a polyline from New York to Seattle and colors it purple. In v8 there is are Polyline and Polygon classes that you can use. The following creates a polyline from Sydney to Los Angeles and colors it purple. Note that the VEColor constructor takes in parameters as (r, g, b, a) whereas the Microsoft.Maps.Color constructor takes in parameters as (a, r, g, b). In v8 you can also use CSS color string as documented here. One noticeable difference is that in v8 there is no pesky pushpin appearing in the center of the polyline for no reason. Both v6.3 and v8 have a method of grouping shapes together as a layer or collection. Both API’s allow you to add customized routes to the map control. In both of the examples below, routes are calculated and drawn on the map by specifying a series of waypoints. Directions in v6.3 are requested using the GetDirections function on the map. The following is an example of how to use this function to get directions from Seattle, WA to Portland, OR. There are two ways to get directions into Bing Maps. The first option is to use the Bing Maps Directions Module. 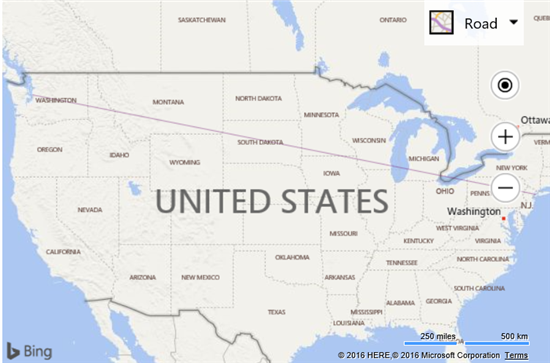 This is an easy to use module that allows you to easily import the routing functionality into Bing Maps. In addition to being able to render a route on the map it can also generate nicely styled instructions. 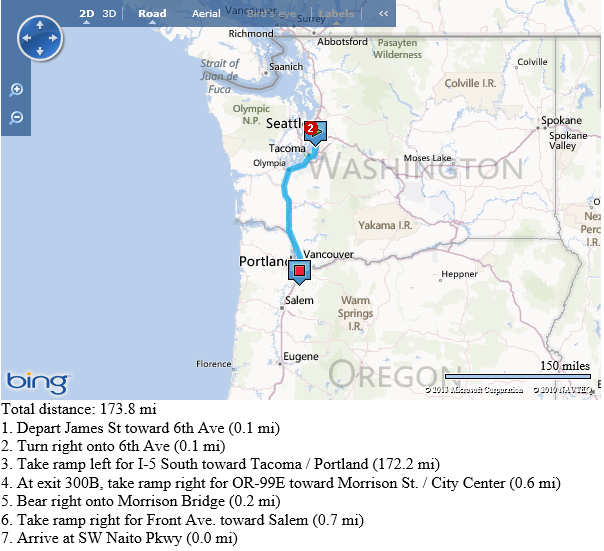 The following is an example of how to use the directions module to get directions from Seattle, WA to Redmond, WA. Notice how much nicer the instructions are and how much easier it was to create them. You didn’t have to loop through the callback and create the HTML yourself. Version 8 even provides alternative route suggests as well. Note that the route result data is available in the directions manager. If you would prefer to format the turn by turn instructions yourself, you can use the route result information to do this instead. credentials: "Your Bing Maps Key"
Once you have a session key simply use this instead of your Bing Maps keys in your REST service requests. See the Understanding Bing Maps Transactions documentation for more details on billable and non-billable transactions. Avoid post backs that cause the page to fully reload on pages that have maps. Every time the page reloads a new session is created. Instead look at using AJAX to pull in data and make requests without refreshing the page. Keep the user on a single page. Spreading the mapping functionality across multiple pages causes multiple page loads/refreshes which generate a lot of sessions. In many cases not only does keeping the user on a single page and pulling in data accordingly reduce the number of sessions created but it also makes for a much better user experience. Generate a session key right after the map loads and store it in a global variable inside your app. This will save you time later in your application when you need to use it. If you have a long running application where you expect the user to be using the app for more than 30 minutes then generate the session key for each request to ensure the key doesn’t time out. 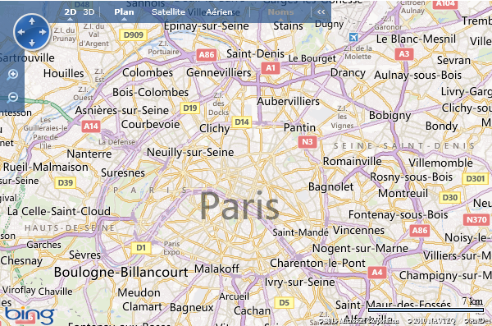 The following is a list of useful tips and tricks when developing with the Bing Maps v8 map control. In all previous versions of Bing Maps, adding an array of shapes required looping through the data and adding each shape individually. This often required 3 – 5lines of code. In v8, simply pass the array into map.entities.push or the Layer.insert functions and the map will add them all for you. This reduces the code down to a single line. Version 6.3 of Bing Maps did not have any support for polygons with holes, however there was a hack to work around this which required creating a line to each hole from the outer ring. Version 8 supports polygons with holes by default. Simply pass in an array of Location arrays, where each Location array is a ring of the polygon. Sometimes you may need to load multiple modules. Instead of them one by one you can create an array of all the module names you wish to load and load them in a single call. There are two benefits to doing this. The first is that it requires a lot less code and second the modules can be loaded in parallel rather than synchronously which will allow you code to start using the modules sooner. It is common for applications to have a search box on a different page from their map page. 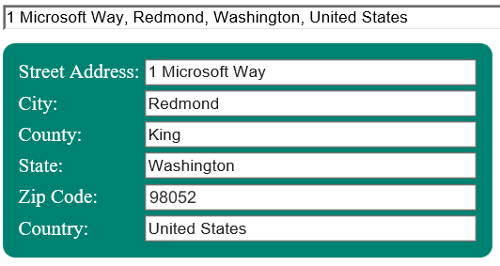 Often these applications call the Bing Maps REST geocoding service to get the coordinate of the user’s query. However, if a location isn’t found for the user’s location, often the user would have to do another search which would generate another billable transaction. The autosuggest module provides a much better user experience by providing suggestions as the user types. It can also be used with or without a map. Additionally, all the suggestions are known locations in Bing Maps, thus reducing the number of potential queries and reducing the number of billable transactions generated by your application. This module is also great at helping users fill out address forms too. Documentation the autosuggest module can be found here. Interactive code samples can be found here. When developing your app, you may find that you need some data to test parts of your application. Version 8 includes a test data generator that can create random locations, pushpin, polylines, polygons and colors. You can find documentation here. Interactive code samples can be found here. If your application is storing data in a spatial database and have created a custom web service to return the data to the webpage, send the spatial data back as Well Known Text. In SQL if you use the STAsText or the ToString methods on a SqlGeometry or SqlGeography object, it will return a Well Known Text string. Version 8 has a Well Known Text module that can easily parse this for you. This would be a much better approach than creating custom data models for handling the spatial data. You can find documentation on this module here. Interactive code samples can be found here. Your hosting requirements are less. If you use a session key from the map, the first 9 million requests to this service are non-billable which would help reduce your overall costs. The amount of code that would need to be maintained by your development team is very small compared to a custom database/web service solution. Version 8 of Bing Maps provides a button that will center the map over the user’s location, however, depending on your application, you may want to do more than just this with the user’s location. Obtaining a user’s location can easily be done using the W3C Geolocation API. This API is exposed through the navigator.geolocation property in the browser. The browser will display a notification to the user the first time this API tries to get the users location, and ask permission to share this data. This example shows how to request the user’s location and then display it on the map using a pushpin. //Add a pushpin at the user's location. //Center the map on the user's location. If you run this code a notification will be displayed asking if you want to share your location. If you allow it to use your location the map will center on your location and a pushpin will be displayed. This example shows how to monitor the user’s location and update the position of a pushpin as the user moves. //Add a pushpin to show the user's location. // Cancel the geolocation updates. Here are some great tools that can be used to make your migration to Bing Maps easy. If you are a licensed Bing Maps Enterprise Customer you can contact the Bing Maps Enterprise support team for assistance with any technical issue you have. They are available by email during EU and NA business hours. You can find contact details for the support team here. The Bing Maps developer forums is also a good place to find migration assistance, especially if you are not an Enterprise customer with access to the Enterprise Support team. The Bing Maps developer forums are regularly monitored by community developers and by members of the Bing Maps team. You can find the Bing Maps developer forums here. If you have licensing related questions you should take them to your Bing Maps account manager if you know who they are. If not, you can send queries to the Bing Maps licensing team and they will assist. For queries inside of North or South America you can contact them at maplic@microsoft.com. For queries in the rest of the world you can contact them at mapemea@microsoft.com. 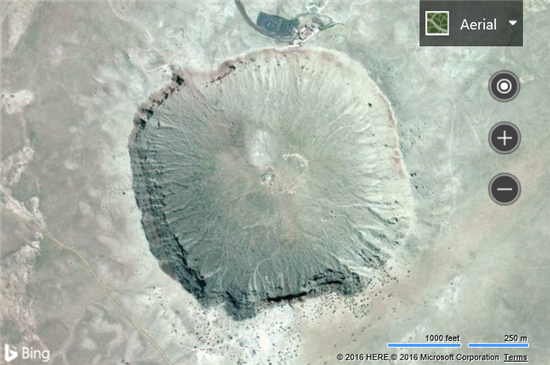 The Bing Maps blog is where the Bing Maps team announces any new features about Bing Maps. In addition to this regular technical posts showing how to do new and interesting things with the Bing Maps controls are made available. You can find the blog here. Both the Bing Maps v7 and v8 map controls support modules. Version 8 is largely backwards compatible with v7. Many modules have been created by the developer community for v7 over the years. Many of these also work with v8 and many of these functionalities already exist in v8. However, there are a few modules in the Bing Maps v7 Modules CodePlex project that may not be in v8 which provide additional functionality that you may require. For instance, there are great modules for importing GeoRSS and GPX data into the map. The table below lists every class type found in Bing Maps v6.3 and provides the corresponding Bing Maps v8 type or functionality to use. Microsoft.Maps.Color or CSS color strings. as (a, r, g, b). Use the PushpinOptions object to customize your pushpin icon. Additional pushpin customizations documented here. Use the navigationBarMode map option to select a different size navigation bar. Alternatively use the showDashboard, showMapTypeSelector, showLocateMeButton, and showZoomButtons options of the MapOptions object to customize the map navigation control. Both miles and kilometers are displayed on the map control. Due to implementation differences, there is not a need for a corresponding type. Use the Bing Maps REST Services to retrieve imagery metadata as described in the Get Imagery Metadata documentation. 3D is not supported. All available map types are found in the Microsoft.Maps.MapTypeId. Use the Mini Map Module. 3D Models are not supported. There is no equivalent class. The table below lists every function found in the VEMap class of the Bing Maps v6.3 and provides the corresponding Bing Maps v8 functionality to use. 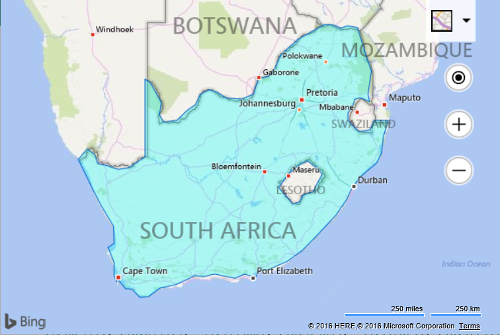 Shapes can be added to the map in two ways, directly into the entities property of the Microsoft.Maps.Map class, or they can be added to a Microsoft.Maps.Layer which is inserted into the layers property of the map. TileLayer, ClusteringLayer, HeatMapLayer can be added to the map by inserting into the maps layers property. Infoboxes can be displayed by using the setMap function of the infobox. Objects stored in the entities property of the Microsoft.Maps.Map class can be removed using the map.entities.clear() function. Items in a Layer can be removed using the layer.clear() function. Layers can be removed from the map by using the map.layers.clear() function. An infobox can be removed from the map by using the setMap function. Customize your own infobox using the htmlContent property of the InfoboxOptions object. Set your options using the setOptions function of the Microsoft.Maps.Infobox class. Use the hide function of the Microsoft.Maps.Traffic.Traffic Manager class to hide traffic. Use the clear function on the maps layers property. Also use the clear function of the entities property if using that as well. Due to implementation differences, there is no need for corresponding functionality. Use the clearDisplay or resetDirections functions of the Microsoft.Maps.Directions.DirectionsManager Class. Use the remove or removeAt functions of the Layer class or the maps entities property. Use the remove or removeAt functions of the Layer class. Use the removeHandler function of the Microsoft.Maps.Events object. Use the dispose function of the Microsoft.Maps.Map class. New birds eye experience being developed in V8. Use the getCenter function of the Microsoft.Maps.Map class. Use the calculateDirections function of the Microsoft.Maps.Directions.DirectionsManager class. Use the getHeading function of the Microsoft.Maps.Map class. Use the Bing Maps REST Services to retrieve imagery metadata as described in the Get Imagery Metadata topic. Use the getPageX function of the Microsoft.Maps.Map class. 3D is not supported. All available map types are found in the Microsoft.Maps.MapTypeId Enumeration. Use the getMapTypeId function of the Microsoft.Maps.Map class. 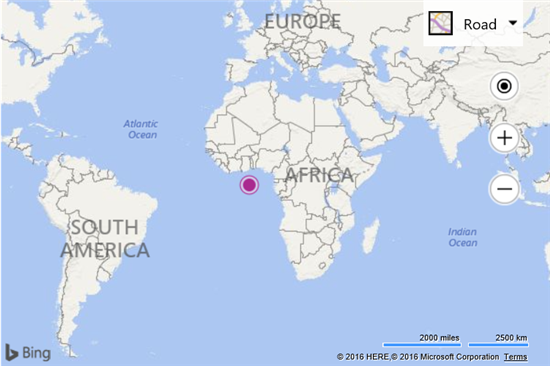 Use the functions of the Microsoft.Maps.Map class to return information about the current or target map view. Add custom properties to the metadata property of a shape. Use the Filter class to search against the entities property of a map or within a Layer. Add custom properties to the metadata property of the TileLayer. Use the Filter class to search against the layers property of a map. Loop through the layers in the map.layers property and count the number of tile layers. Use the getPageY function of the Microsoft.Maps.Map class. 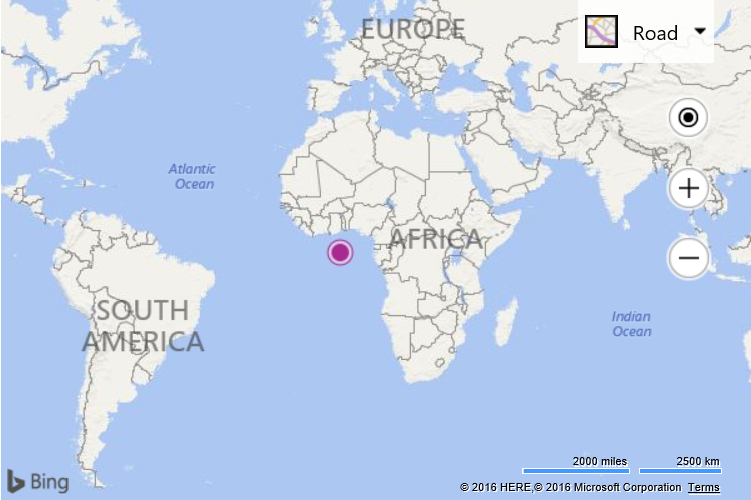 Use the getZoom function of the Microsoft.Maps.Map class. Loop through all layers in map.layers property and use setVisible(false) on each layer. This is supported by all layer types. Use the showDashboard, showMapTypeSelector, showLocateMeButton, and showZoomButtons options of the MapOptions object to customize the map navigation control. Set the visible property of the InfoboxOptions object to false using the setOptions function of the Microsoft.Maps.Infobox class to hide an infobox. Use the setOptions function of the Microsoft.Maps.Map class to set the showScalebar property of the MapOptions object. Use the setVisible function on the Microsoft.Maps.TileLayer class. Use the hide function of the Microsoft.Maps.Traffic.TrafficManager class to hide traffic. Get the bounding box of the map, and use this to create an array of locations. Add the location that you wish to add to the view into the array. Use the LocationRect.fromLocation function to generate a new bounding box and use this with the setView function of the map. Use the tryLocationToPixel function of the Microsoft.Maps.Map class. Use the show function of the Microsoft.Maps.Traffic.TrafficManager class. Use the setView function of the Microsoft.Maps.Map class to set the center property of the ViewOptions object. Use the tryPixelToLocation function of the Microsoft.Maps.Map class. Simply change the map DIV size and the map will automatically resize accordingly. Set map view properties using the setView function of the Microsoft.Maps.Map class. Use the setView function of the Microsoft.Maps.Map class to set the center and zoom properties of the ViewOptions object. Client tokens are not supported. Use the credentials property of the MapOptions object to set the map credentials. Your credentials are your Bing Maps Key. Use the navigationBarMode of the MapOptions object to select a navigation bar that is a different size. Note that the navigation bar automatically changes to a different size when the map is loaded on a mobile device. 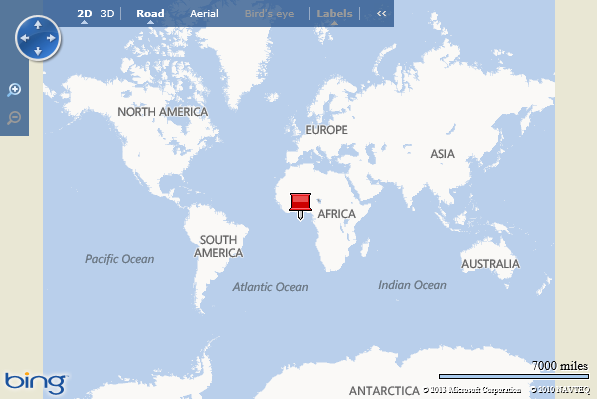 Create a basic infobox using the Microsoft.Maps.Infobox class. Use the setView function of the Microsoft.Maps.Map class to set the heading property of the ViewOptions object. Use the setView function of the Microsoft.Maps.Map class to set the mapTypeId property of the ViewOptions object. Use the setView function of the Microsoft.Maps.Map class to set map view properties of the ViewOptions object. The mouse wheel always zooms to the cursor position on the screen. Use the setView function of the Microsoft.Maps.Map class to set the pitch property of the ViewOptions object. This will change the pitch of a Streetside image. Scale bar displays both km and miles always. Use the showLegend or hideLegend functions of the Microsoft.Maps.Traffic.TrafficManager class to hide/show traffic. Use the setView function of the Microsoft.Maps.Map class to set the zoom property of the ViewOptions object. The disambiguation dialog is not supported. The find control is not supported. Add an infobox to the map using the Microsoft.Maps.Infobox class. Add a div to your HTML page to show a message. 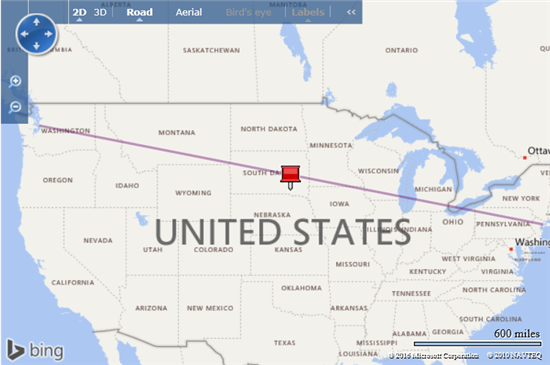 Add a tile layer to the map using the Microsoft.Maps.TileLayer class. Use the showLegend function of the Microsoft.Maps.Traffic.TrafficManager class.